Peace Court is the novel I’m working on now. I’m hoping this will be the next volume to appear in The Shanghai Quartet. to be a critic of the government without getting shot. The body came out of the apartment. A murmur rose from the crowd. “Who is it?” Mrs. Yip cried. She had been the first to rush outdoors when the lorry drove in Peace Court. To her joy, the body was now placed on the apartment building stoop where she could stare at it unabashedly. A sheet had been stretched over its length, leaving only a pair of horned feet exposed. “I’m standing right here,” Mr. Ou said, not unkindly. In addition to trying my hand at humor, I’m also trying out some new narrative techniques. First, I’m inserting fictitious penny novels and police station confessions, self-criticisms and interrogation manuals. Just as Barbara Kingsolver did in Lacuna in order to create the texture of the time. For Peace Court, that means the paper detritus of early Communist China. Second, I’ve divided my novel into 5 acts. Shanghai is the stage. The characters appear in one scene and disappear from the next. Stage sets move into the spotlight: the courtyard of Peace Court, a jail cell, the ravaged gardens of Del Monte House. You could also say that I’m writing about the separate worlds of men and women. Peace Court is where the women of my novel reign: Jin, her daughter Song Li and the local gossip Mrs. Yip. Outside is the world of men where we travel through China with the pimp Feng and Inspector Qian as they journey towards Shanghai. These worlds will clash at Peace Court. Neighbor will turn on neighbor. Children will revere the State more than their parents. Smash the old ways! You might think (as I did) that these things didn’t happen until the Cultural Revolution. But Mao lay the groundwork early and well. Frank Dikötter’s work, The Tragedy of Liberation: A History of the Chinese Revolution 1945-1957, has been critical in the creation of this novel. It’s fed my imagination with the everyday realities of life in China at that time. The local gossip Mrs. Yip and the bumbling police Inspector Qian will supply the humor in this tale. She’s a self-important busybody. He’s a believer, sent to Peace Court to hunt down enemies of the State. To put words into his mouth, I’ve used the most illustrious sources: Sun Tzu and Mao Zedong. But the tragedy belongs to Jin. Sold as a child and thwarted in love as an adult, Jin is now bitter and old. She loves her daughter Song Li with an intensity matched only by her hatred for her husband Kang. After all, he tried to kill her with her own cleaver, though he managed only to cut off her arm. That missing limb and the phantom pain it implies will sunder the community of Peace Court into those who pity Jin and those who side with Kang. The schoolgirl Song Li stands in the middle of this fray. She is faced with the impossible dilemma. Which parent should she love? When I was still at work on The Dancing Girl and the Turtle, I could focus only on the words. The manuscript itself, the blurb on the back, all those marketing materials. The last thing we finalized was the book cover. This time around, I already know the image I want for Peace Court. 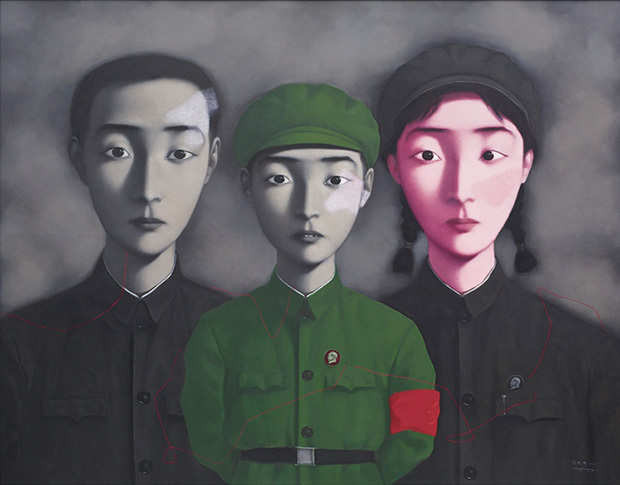 Zhang Xiaogang was born in Kunming in 1958 and came of age during the Cultural Revolution. He’s reckoned as a member of the Cynical Realism movement. Cynical realism was humorous and satirical in tone, and adopted the style of social realist painting (the only officially sanctioned artistic style at the time [in China]), but the content is far from idealistic. Zhang is such a big name now that Saatchi Gallery represents his work. This painting comes from his series Bloodlines. Its name is Big Family 3. The work sold for a record price in 2014. That could very well mean that the image rights will be too rich for me. But Sotheby’s understands exactly why this work appeals to me. The work is […] the only piece from the series to depict the Little Red Guard with the Chairman Mao badge and armband, making it of greater rarity and art historical value in comparison with other works. There will, no doubt, be much more research for me to read and even more manuscript re-writing to do. But don’t worry, I will finish Peace Court. And you’ll be the first to know when I do.